Winning Comment 117! Congrats Graves Family! I am a health nut. Having spent the majority of my childhood in the hospital battling Lyme Disease and being sick because of my suppressed immune system, it is important to me that I remain healthy. I take a multi-vitamin everyday (now a Fairhaven Health Prenatal) and I also take Calcium, Vitamin D and Fish Oil Supplements. Isn't it a no-brainer that I also feed Dexter a multi-vitamin everyday as well? I say YES! I am proud to say that I have found and have fallen in love with the world's first ORGANIC GUMMY MULTIVITAMIN!! Thats right! Its organic and all natural! Whoa, how awesome eh? made with all natural flavors AND colors. 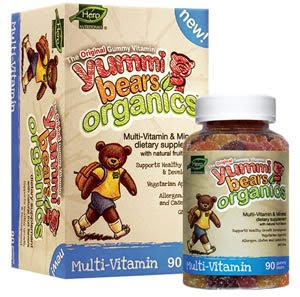 I absolutely love that Yummi Bears Organics® by Hero Nutritionals ® are also gelatin-free! Just perfect for families living a veggie lifestyle, since gelatin is made from cow hooves and all. These Yummi Gummies are also free of: yeast, wheat, milk, egg, soy, salt, tree nuts, peanuts, shell fish, and preservatives. Are made with organic cane juice and organic tapioca syrup. The rest of the other ingredients including supplements, color and flavors are organic compliance with the organic regulations. Dexter doesn't get sick and he rarely has any problems. I don't make claims that it has anything to do with his multi-vitamin regime but I know it doesn't hurt! Dexter also takes Hero Nutritionals DHA supplement that isn't vegetarian because it is made with Fish Oil. He loves taking his vitamins and he asks for them each morning after breakfast. I adore the way he says "mitamins" We also take the time to count them out and practice numbers. I love giving him something that is so good for him and he loves them because they taste good. Each organic bottle can be found at GNC and the Vitamin Shop and are $19.99. Today, one lucky winner will win 3 bottles! A $60 value! How awesome is that? Just tell me what your child takes for vitamins now and if they don't take anything, why or why not? This contest will end on May 4th at NOON EST. Good Luck! It is open to US and Canadian entrants! They take centrum children's vitamins. My daughters take Kirkland Signature Sugar Free Children's Chewables. I follow you via GFF! They take various chewables (I know I am terrible). They are 6, 5 & 4 and it is hard to get them to like anything. We entered your Little Green Book Giveaway. We entered your Happy Green Bee Giveaway. We entered your Safety 1st Air Protect Car Seat Giveaway. We entered your $100 Original Sprout Gift Basket Giveaway. These sound fantastic because my son has a gluten allergy and because they're organic! Currently my kids are taking a Quest chewable multi-vitamin! I found your site through meeting you at Eco Store! I entered your EO giveaway! I entered your The Boys Store giveaway! My son isn't on any vitamins as of right now because honestly I was waiting til he turned 3 and I didn't even know where to start looking for an affordable, natural vitamin. My kids occasional takes Member's Mark Gummies. My daughter is taking Disney Gummies Children's Multi Vitamin, only because I had a coupon for them! I entered your Safety 1st Air Protect Car Seat giveaway. I entered your $25 GC to Earth Mama Angel Baby giveaway. I entered your Nalgene BPA Free Bottles giveaway. I give my children Vitamin D (and probiotics). I'd like to give them Vit C too. I follow you on Google Friend Connect (Laureen M-H). I originally found your site on Prizey. I entered the be present giveaway. I entered the Livie and Luca giveaway. Currently no vitamins, because we just ran out but they used to take yummy bears as well. Found your site via prizey. I have your Earth Month button on my blog. I found your site through Prizey! My kids are taking the Nordic Berries right now but we switch kinds every bottle for variety. I entered your Sula giveaway. I entered your California Blooms giveaway. I entered your Dr.Hauschka giveaway. He takes Flinstones and he likes it, thinks it's candy. DD takes some cheapo gummy vitamin I found at Walmart now. My daughter currently takes gummi vitamins that I got from Trader Joes.